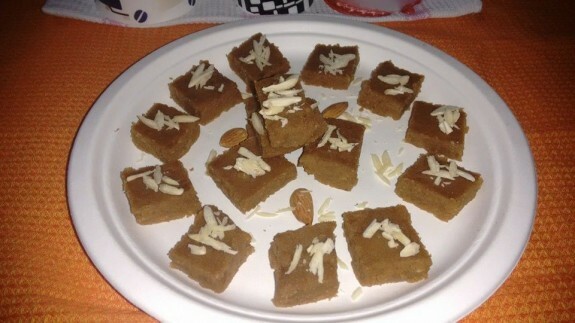 Atte Ka Sheera is a really tasty and traditional recipe which is made in any festival or occasion specially in Guru Nanak Jayanti in Indian household. You can also try this any time at home. 1. Heat a Pan and pour the ghee. Add wheat flour and stir fry it on medium flame. 2. Stir it continuously until the color changes and you get the aroma of the roasted flour. 3. Side by side add sugar in 3 cups of water and boil it. 4. When the flour turns into golden brown, add the boiling sweet water. Keep on stirring so that lumps do not form. 5. Stir gently and when the excess water evaporates and the consistency is semi thick, add a pinch of elaichi powder in it and mix properly. Remove it from gas oven. 6. Cut it into diamond shape like the image and garnish it with chopped nuts. 7. You can serve it warm or cold as per wish.